Some people are better at some things than others. I can't cook. There . . . I said it. I mean - I can follow a recipe, but it's not an innate ability. Nor does it ever taste as good as someone who can cook. I collect nifty things for my kitchen. Nothing up my sleeve . . .
Presto! Look at that cookie jar - it's soooo cute! that soup was served in. What was that soup again? mmm . . . salt . . . where's my lick? and one from my dream kitchen. Canisters, and Salt & Pepper shakers . 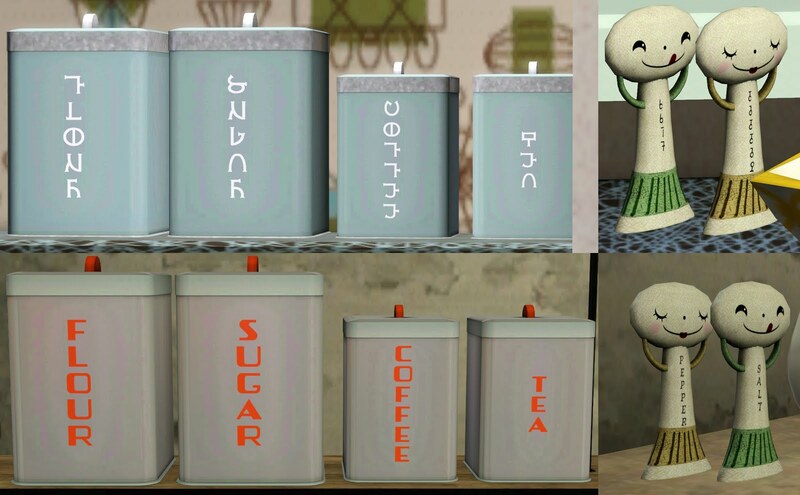 . .
Simlish and English versions . . . Canisters also have a blank version. 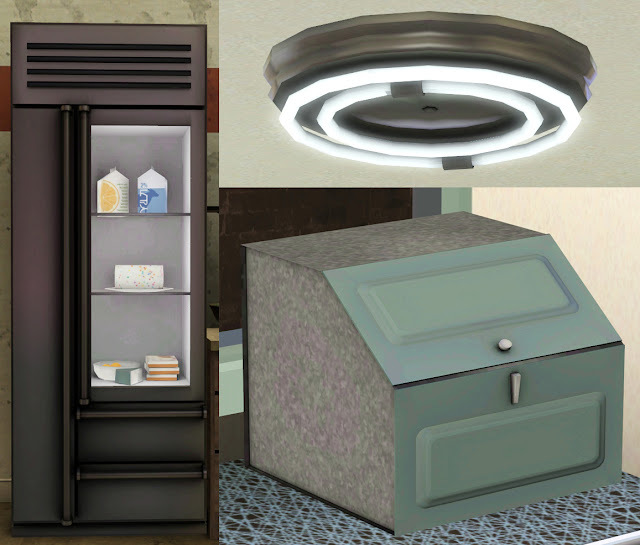 An industrial refrigerator, a fluorescent light, and a breadbox (acts like a chest a'la WA). 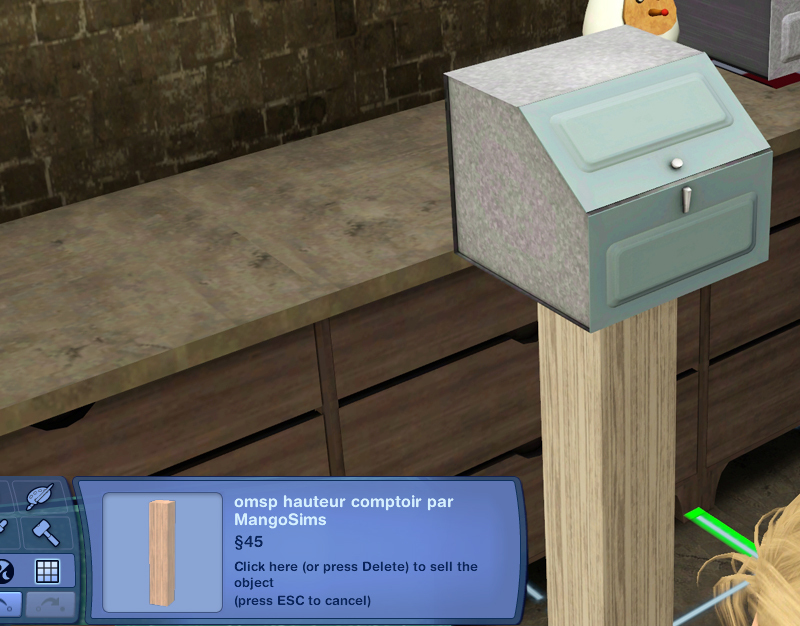 and breadbox acts like a chest to hold things - it too has slots on top of the box. Can you guess which one I don't seem to have $14,000 to buy? Me either! My dream life is that vivid. 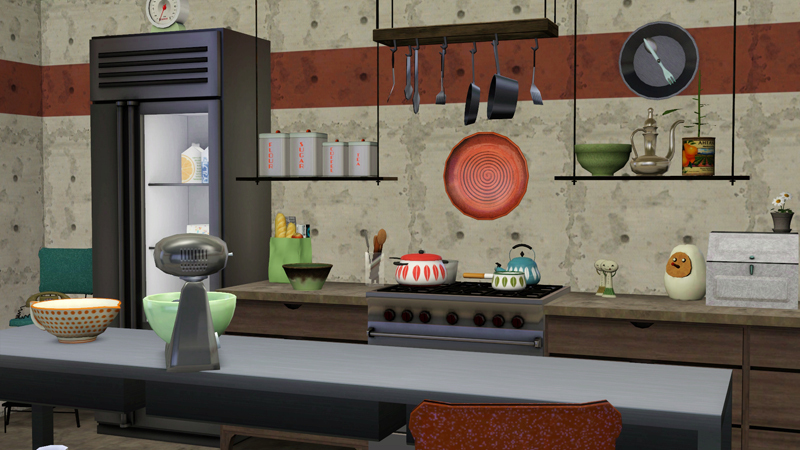 All to fancify your sims retro, modern, or retro-modern kitchen. Fancify . . . sounds like a brand of cat food. Speaking of cat food . . .
multiple tiling in each item. If your pattern doesn't look good on one, try another style. 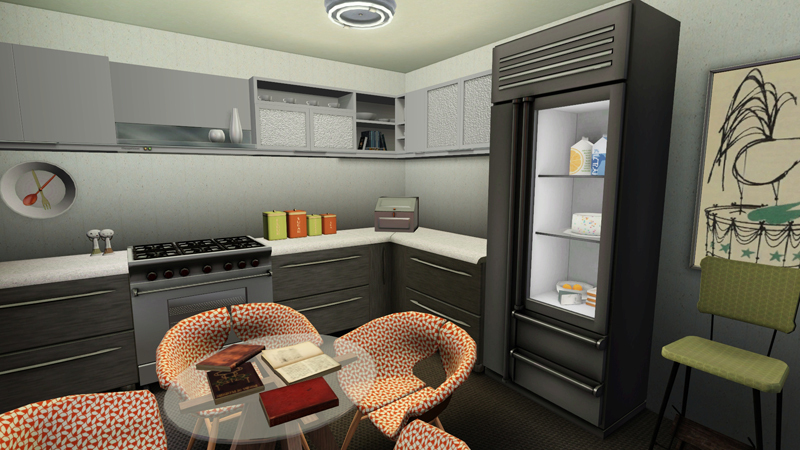 The canisters and shakers have additional slots to build upon the look you want. Sometimes you need less than what is grouped - this was for versatility. The large canister has two slots to allow for either the small or large canister to sit next to it. The small canister has one slot. I hope with Unleashed that these can be updated to be functional for say 'pet treats' - I opted to not make these chests as it would be redundant. The salt/pepper shaker also has a slot at the front corner. These slots are designed to allow for full rotation, you may need moveobjects on cheat to allow them to fully rotate without problems. lighter than the color selected. Light output acts like any other light and can be changed as thus. Breadbox, I am told, works fine - even without WA installed. granthes Multi-height OMSP Click to enlarge for specific instructions. All the testers and commenters while this set was being pulled together. Oh Bau...what a wonderful set. Those shakers bring back so many wonderful memories as a kid. The whole bloody set does actually! Thank you, thank you, thank you! Wow, what an absolutely brilliant set! 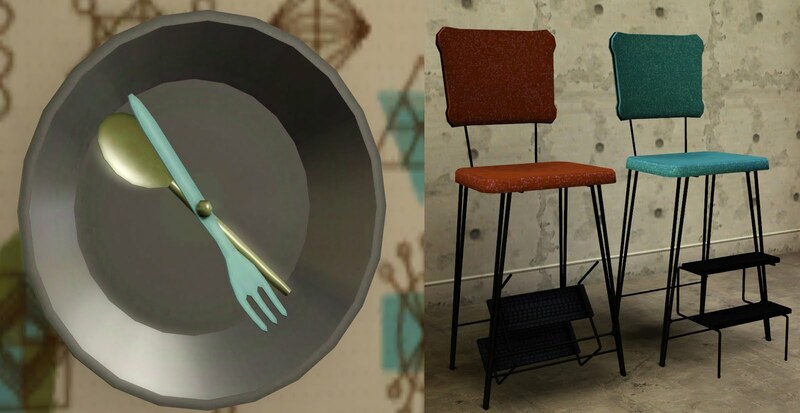 This is all going to come in so useful, and the idea of the step stools is completely inspired. Thank you bau! Haha, did you grow up in my home? I swear you have lots of things I grew up with. 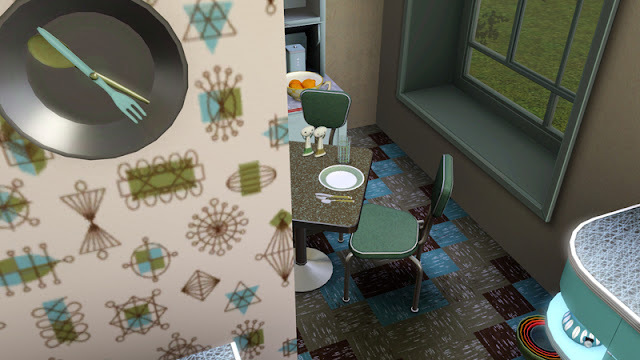 The fluorescent light, the bulb would break and dust would fly out, the step stools, played on the steps and used it to sit at the breakfast nook. The old breadbox that held everything but bread, the canisters, my mom's main staple of the kitchen. I am so happy you created these goodies! Thank you. As a kid, my grandparents had one of those step-stools and all of us kids adored the thing. Everything in this set looks beautiful and I thank you so much for all of the obvious time you put into the creation of the set. I feel like the coffee canister has to many letters on it for my tastes though. It would look nicer it it said "cafe", to more resemble the tea canister and look like a set. Thanks everyone - this set was an absolute labor of love - I am glad it is being well received. Sooo many of you have said it is nostalgic to you, which is great that this set is meaningful to more than just me! I think I am most surprised to hear that the step stool is familiar - I haven't seen another myself and wonder now if it is not originally from the states. It's a clever and simple design with the way the steps turn. I have a love hate relationship with that light figure in my kitchen and true story - I almost sold those shakers on eBay back in '98. They would have sold for $4 if my friend didn't rush in to outbid the high bidder. Arfmoo - while I agree that the word coffee seems long, it is consistent with the original as well as other sets I own or have seen. I often feel it looks too long on the real ones in comparison to the painfully short 'tea.' The lettering was the biggest challenge on these and I discuss it at my side blog. Clarity was the most important element to me where it was to be recolorable, so it is larger to aid in this. The originally lettering was smaller and choppy looking which simply wasn't going to work. Jen thank you for going over this set with a fine tooth comb - really, it was your feedback that made this set as best as I could make it! OH! Anyone know where that vintage pattern is from BTW?? My one dislike for the game is that it will not credit patterns . . . these artists need recognition too! Awesome set! 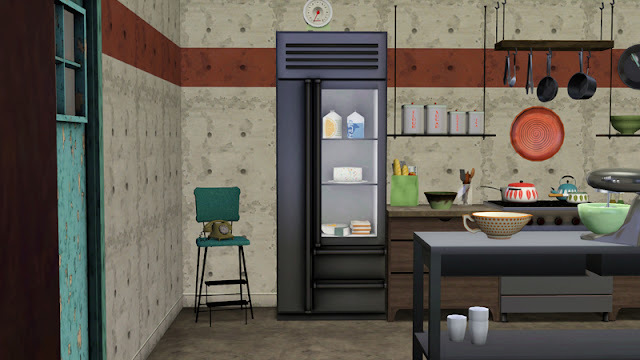 That refrigerator is gorgeous, I really like the mix of old and new. And I'm with Spacerox. My Grandma had a white step stool exactly like that one. I have many memories of her perched on that stool, legs crossed, drinking her coffee or reading the paper. I just came upon you stuff and really enjoy it. 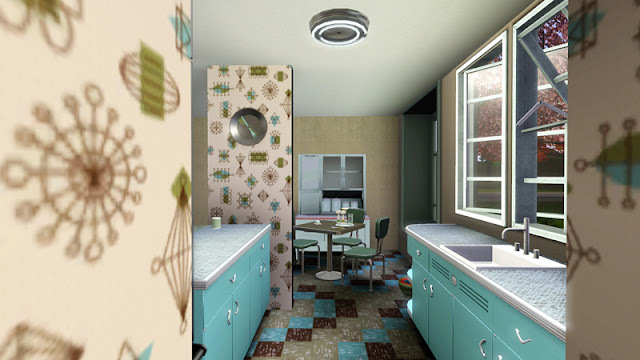 Where can I find the atomic-looking wallpaper design? 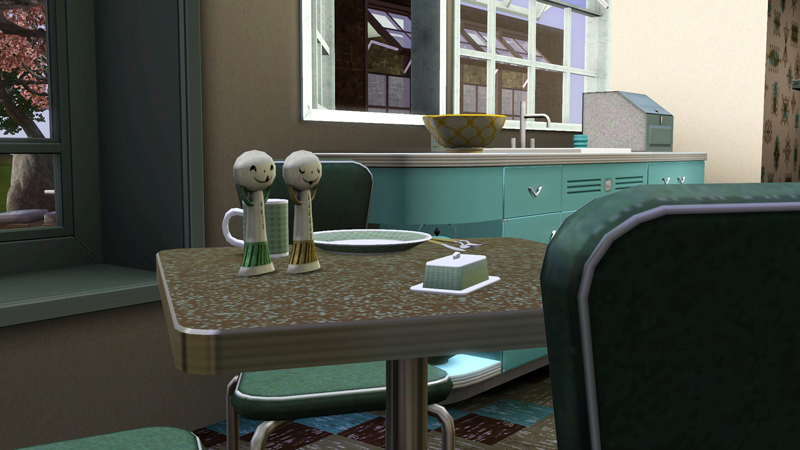 I collect retro dinnerware and this looks a lot like one of my favorite sets, Salem North Star. Thanks for sharing all you great work! The paper is credited above in the links - it was created by hysterical paroxysm (photo one second credit) and really is such a wonderful pattern. It's pink and blue pre-CASt. Do you know I have a set of North Star that I have yet to officially use and I've owned it for probably 20 years? I spent a good many years attempting to finish the set with every variation of cup, bowl, and shaker. I have had bakeware, glasses, and even one of the elusive teapots. When I moved from New England I sold a lot of the rare pieces, but recently found the batter bowl. I had this thought I would try to collect the Hopscotch version as well, but found it elusive. I even tried to pull together a whole set in pink - also elusive. I have owned a number of Salem styles and think they are one of the most overlooked of the cool atomic era. I had a complete set of Biscayne as well but gave that up too. What I do use every day are the go-along turquoise plates - I have a stack of maybe 30 of them left (after giving a number of them to my Mum). OMG!!!!! Wow!!! 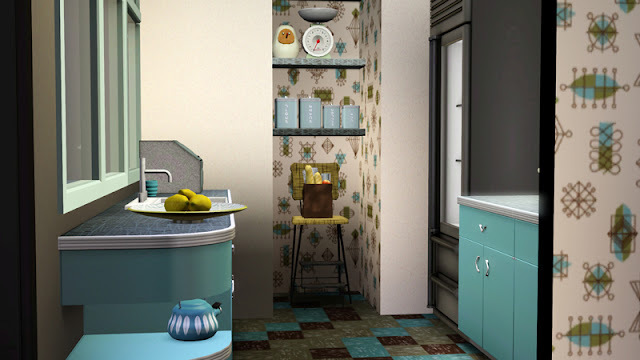 What an amazing, wonderful kitchen, love, love it. All your creations are just incredible, your site is a real treasure find to me. Also millions thanks for all your hard work in rigfix everything.... that must have been quite a job. Which expansion came with the beautiful turquoise counters? The counters are credited above - picture 1 - to Awesims. I have not provided a direct link, but her tag "Kitchen" under Sims 3 will get you to the counters. No problem - always happy to help! And thank you!